Senri Chuo is a city located in Toyonaka city in Osaka prefecture. It is conveniently about 25 minutes to Osaka station and 51 minutes to Kyoto station. 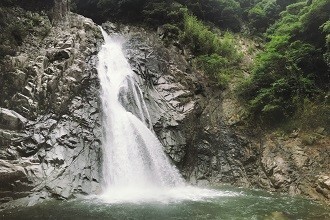 A beautiful nature site near Senri Chuo city is the Minoh Waterfall. The waterfall is nestled within a mountainous area and is popular for tourists in the autumn. In Toyonaka prefecture, you can also visit traditional Japanese farm houses. The farm houses are complete with furnishings from the 1950s. You can dress up in kimonos, experience a traditional tea ceremony and see how millstones grind soybeans! Senri Chuo has a diverse choice of food selections. You can find local izakaiyas, or Japanese restaurants, as well as Indian, Italian and Chinese restaurants as well! I like how peaceful my area is. It is very quiet even though it is close to the Itami airport. I am also very close to the station and 3 supermarkets! I can easily get downtown by using the Hankyu train. It takes about 15 minutes when it’s the express train. It is very easy to do all my errands. With the 3 supermarkets close by I can easily compare prices and buy certain items at different places. I use go to the cheapest supermarket which is also the closest. The post office and my bank’s ATM are about 5 minutes away on foot and right next to each other. This is the most convenient place I have every lived even compared to when I lived in Brooklyn, New York for two years. During my first Golden week my co-trainee and I who I became good friends with decided to go to Nara, Kyoto, and Kobe in 3 days. We went to Kobe first but went during the late afternoon to the evening. There we walked around the Harbor when it was getting dark and saw many couples in the area. Later we searched for this Jamaican restaurant that I heard about through a friend. There we enjoyed some good Caribbean cuisine I had been missing for a while. The next day we traveled to Nara and searched for the deer everyone was talking about and fed them. It was one of the most exciting and smelly activities we did there. After wandering about we tried to go see the famous big Buddha but missed it due to not realizing the closing time. Finally on the last day we spent the entire day in Kyoto where we walked to many temples and shrines. We ended at the Kinkaku temple. After those three days our legs were really sore and we were happy that we were able to go to all three places as day trips. I still occasionally go to these places since I live close to them. There are still lots to see there that I couldn’t see in one day.